In September 2016, Fox News publicly chastised Sean Hannity for getting too close to Donald Trump. “We were not aware of Sean Hannity participating in a promotional video,” a network spokesperson said after being informed that the conservative host had endorsed Trump in a campaign ad , “and he will not be doing anything along these lines for the remainder of the election season.” Some questioned whether Hannity might face disciplinary action for committing what would be a damning ethics breach at any other media outlet, and wondered where his truly loyalties lay. 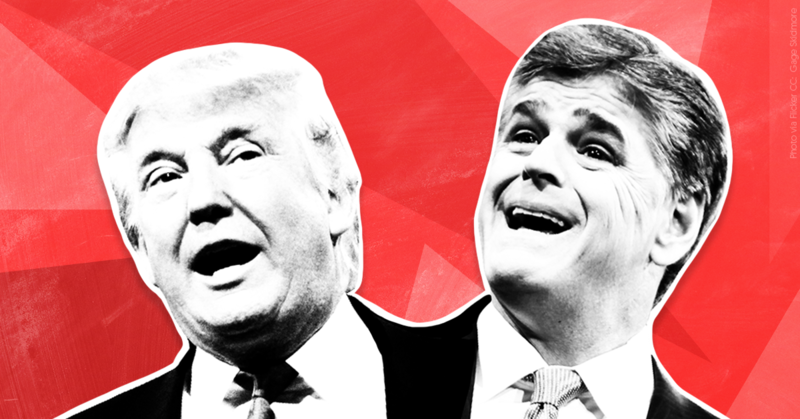 “Who Does Sean Hannity Even Work for Now: Fox News or Donald Trump?” asked  The Daily Beast’s Asawin Suebsaeng. Trump’s ascension to the presidency triggered a merger  with the right-wing network. Fox is now functionally a propaganda arm of his administration, despite quibbles to the contrary  from its executives. And Hannity, on the one hand a Trump friend and adviser, on the other the network’s biggest name, is the keystone of that alliance, an untouchable star in Fox’s firmament . This is a bit too on the nose for Fox, which has responded by telling reporters  that Hannity will be attending the rally to interview Trump, not to campaign for him. But of course, this is a distinction without a difference -- Hannity’s Trump “interviews,” like the rest of his program, are indistinguishable from White House promotional material. Hannity will serve up softballs, leading the president through his talking points, bolstering his denunciations of his enemies, and helping him fearmonger about immigrants. The crowd will cheer Trump and boo his enemies on cue .